Well the time has come to begin the rack and pinion conversion on my 69 510 with the LZ24 engine. First order of business that comes to mind is the dip stick. Step 1 is to find a front sump oil pan. Done. I had a 510 "V2" L20b sitting in the corner with a front sump pan. Got it off and clean and it's matching pickup ready to go. Step 2, the hard part, the dip stick. On the LZ24 block the dip stick hole is left side far back rear, which is really fun when you have the carbs and exhaust manifold on an L20 head blocking access. Now I have a working solution for that, (Lokar) but that's not going to work when I change to the front sump pan. What to do? The LZ24 block has no "blank bosses" on the right side where a dip stick might go. I'm thinking going in the right side of the oil pan itself with a welded in "S" tube and run the dipstick up behind the alternator and infront of the oil filter. Nice little space right there. Anybody have any other bright ideas about a dipstick solution? Past experience? A wee bit of googling, and look what I found! Pair this up with a matching ford dipstick tube and dipstick (modified for length natch) and I think I may have a decent solution. Rockauto has these parts for $7, $36 and $25 CAD for the flange, tube and dipstick respectively. Interesting as I've built an LZ24 also but I think I'm calling it an L24B as there is already an L24 L6 out there and this is a nod to the L20 and the L20B. It's for my 710 and I have a spare L20B 710 oil pan so nothing changes there just the larger displacement block above it. Most car oil pans are a mid engine, slightly to the rear sump with room for the steering to clear at the back. Why not use a 510 oil pan and make the R&P fit it? I was just going to check the oil when the engine was cold. But now will look at extending the dip stick tube and run a longer 'stick'. The one in our work van has to be a meter and a half long. The rack and pinion is JBCoachwerks custom cross member and R&P solution. Oil pan has to accomodate it, not the other way around. I have not fitted anything yet, so I really don't know what pan or mods to the pan will be needed. JB clearly said that the rear pan won't work, well actually I think they said that a front sump pan will be needed. Dip stick has to move. The engine I have is a Rebello built LZ24(b) block with an U67 L20B head. Tall sucker, just fits as is. Can't wait to make it fit with the new crossmember... Had to do a bit of cross member "thinning" and engine mount slotting and cross member to body spacing.... Ah the things we do to 'improve' our cars. The L20B is 20mm taller than the stock L16, and the Z24 is 20mm taller than the L20B. Lets hope so. I'm only going from an L20B to a Z series block so 20mm / 3/4". If the L20B makes 95 hp (on a good day) then just the 20% displacement increase should net me close to 120 hp. Compression will be just above 9 so that should be even closer. What I do expect is gobs of torque from a stroke increase of over one cm. So I have the Ford dipstick parts and I've started the pan modifications. The one detail that might make this system a bit less than ideal, is the the static oil level in the pan when full, is well above the top of the adapter flange, making the static oil level somewhere up in the dipstick tube. Typically the tip of the dipstick comes out of hole in the block, THEN goes down and dips into the oil in the pan, ensuring a clean stick until you touch the real oil level. With the static oil level up in the dipstick tube, I'm a bit worried the narrow dipstick tube will somehow make it more difficult to get an accurate reading. As long as the dip stick tube is open at the top, oil should rise in it to the same level as that in the pan, but oil sticking the sides of the narrow tube is what I'm worrying about. I'll have to run some experiments and see. I'm doing basically the same. What's the problem with the Z24 dip stick location? The Z 'stick' isn't a 'stick' like the L series is. It's more of a conventional thin ribbon. I'm sure the tube can be bent into any position. My 'stick' will need to be calibrated for the 710 pan depth. The stock location at the back left now points into the shallow end of the pan. I put a front sump pan on the motor due to the rack and pinata conversion. aaAAhh! My pan remains the same just the L&R changes. 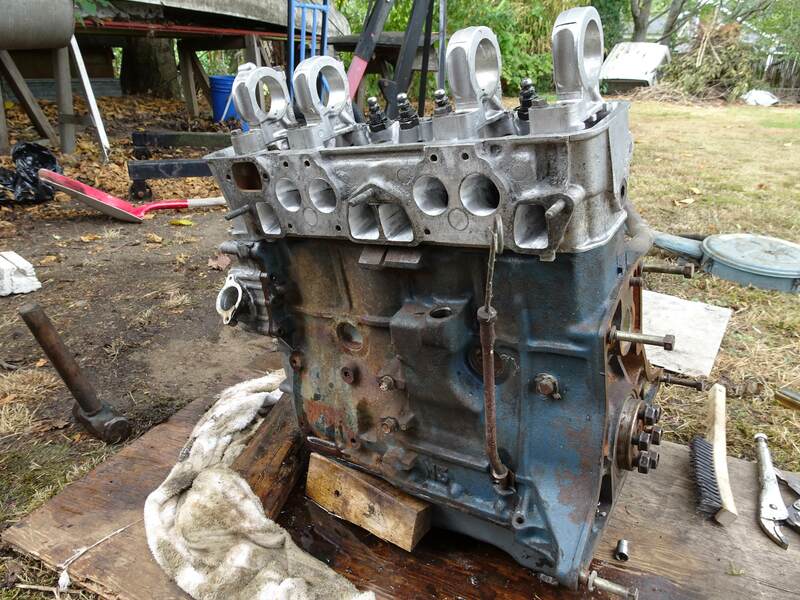 So what head/cam and what carb(s) and manifolds are in your plans for this? The engine is a Rebello build 2.4. It has a A87 peanut head and some nasty cam the Dave supplied. I've been running a pair of 42mm Z SU's on it, but it's going to get a set of Jenvey Heritage throttle bodies (look like Webers, hidden injectors underneath) this year and better exhaust. It dynoed at 200 hp with a pair of 44 mikuni's when Dave built it. Hope I can measure the oil level properly after the changes. It does use a bit and I have to keep my eye on it.